Sometimes, the good ol’ http://localhost web address isn’t enough for local development. In fact, if you are hosting or developing multiple sites, a single web site can be down right limiting. Windows 7 lets you create multiple web sites which alleviates this and lets you create sites for specific projects. A further extension of this is to apply host headers to your local machine sites and then you can reference them however you like. You can find your hosts file (on a windows machine) in c:windowsSystem32driversetc. It’s in a protected location on your computer, so you will need to open it with higher priveleges. To do this, find the file in the above location and right-click on it. Select “Run as Administrator” from that menu. Now it’s a special windows file and has no file extension (like .doc for Word document) so you will need to tell your machine which program to view the file in. My suggestion is your favourite text editor like Notepad or Wordpad. Open the file and you’ll see host names that are already configured for your computer. Notice there is one already there for localhost – looks familiar right. Even though localhost isn’t handled in the hosts file, it gives an indication of what we are trying to achieve. 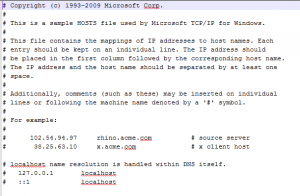 The top section of the hosts file (everything line that begins with a #) is just comments and does not affect how the file functions. So what we want to do is create another line beneath the comments. There is a convention for how you enter this information so be careful. Type your new host name in the “Host name” field. And there you have it. You can open your browser and type “http://projects.dev” in the address bar and your site will be running. There is a chance that you permissions may be a problem, but that it outside the scope of this article. You know where your website files are, so you will need to make sure you website permissions are set for the identity of the Application Pool used for your site.